Do you know how Market Sell vs. Limit Sell differs? If you don’t, you’re losing money every time you cash out your Lindens. 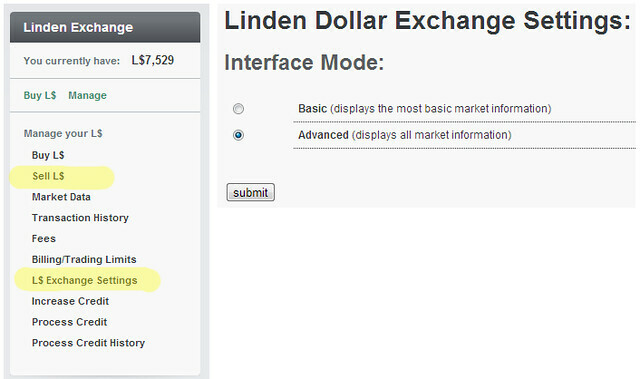 I discovered back in 2007 after selling Lindens a few times, that I could set a better rate than what’s offered by default on the Linden Dollar Exchange. First, go to L$ Exchange Settings in your SecondLife.com dashboard and change the Interface Mode from Basic -> to Advanced. 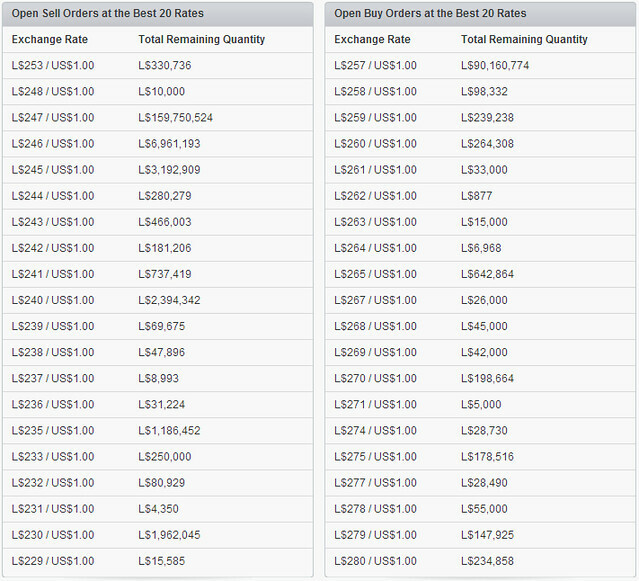 Then go to the Sell L$ page and look at the Open Sell Orders at the Best 20 Rates, and decide what Exchange Rate you want to sell at. I typically sell at L$248/$1.00US (sells almost instantly, if there’s less than a million Lindens listed already), or some people sell at L$247/$1.00US and the wait may be a few hours to a few days. Any exchange rate higher than the usual lowest rate or not listed there, will sell instantly. For example, in the picture below, you’ll see that there’s L$330,736 listed for the L$253/US$100 rate, and that person could have listed for $248 and sell instantly, but for some reason they didn’t (and losing money in the process). 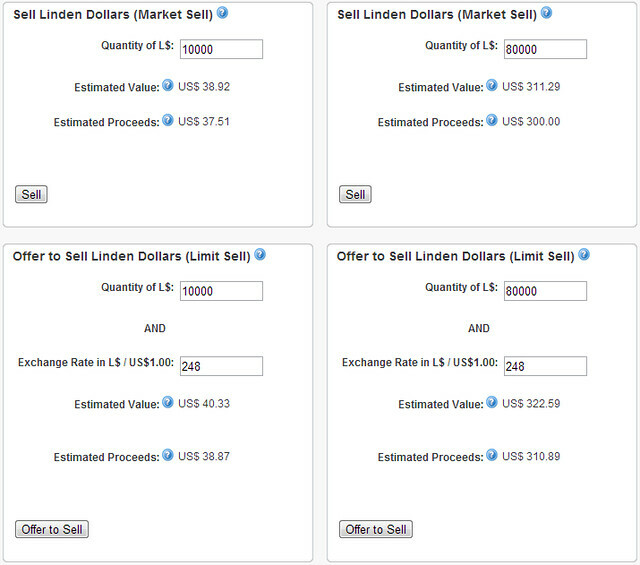 As a seller, you want to exchange the least number of Lindens for $1USD. The same concept can be applied to Buy orders, except in the reverse. You’d want the most Lindens for your $1USD if you’re buying. Here’s an example of how much money you’d lose selling at Market Sell (the rate determined by the Linden Dollar Exchange vs. Limit Sell (the rate set by you). That’s not much of a difference, but what if you’re selling hundreds or thousands of Lindens per month? Think of how much money you could be losing (or gaining) if you used Limit Sell to your advantage! Very helpful. *o* Thank you! just sent this link to my bf. helped him LOADS. thanks so so much! Very helpful, thanks! I thought it would take forever if I used Limit Sell. Charlotte, it takes me on average (@ 248, for years now) an hour or two at most… even if there is a bunch of L$ up there at 248, never longer than two. I do it around when I make dinner once per week (since the transfer to PP fee is 1$ USD, I only do it weekly – used to be monthly when I made less…), and by time dinner is done or right before sleep, it’s ready to send to PP. Limit Sell really does make a difference, hundreds per year. Thanks, Ke. That info is very helpful. I never really understood that stuff before. I feel like I have been throwing away money for such a long time. So glad you published this. Hi… I will be using your tutorials for my brazilian blog for brazilians residents in sl, ok? always giving credits to your blog… can I ? Hey, useful information but can you tell me how to increase the sell limit on my account? It says I can’t sell any lindens even though I have plenty. Why wouldn’t you sell at $237 or $231 even? Both have a total remaining quantity less even than your 10,000 that you used as your example. So would these amounts not sell instantly and generate even more return? I am new to the selling of Lindens on the exchange so all these numbers I find confusing. Could you explain the significance of the “Total Remaining Quantity” row and how it relates to the “Exchange Rate”? For instance, when I typically buy Lindens from within SL, lets say 10,000L, how does that buy relate to the selling of these lindens on this exchange? Does it automatically sell at the highest rate possible and when might those lindens be sold at a much lower rate? In your post you state that anything under a million typically sells instantly, right? So, by that standard the first SIX rates will not sell instantly? Selling 2000L at a rate of L$232/1.00 looks like it would see well, or no? This is very confusing. Any help you could provide would be greatly appreciated. If however, you don’t want to explain it all, what rate would you suggest I sell at for an instant sale and best return using the above numbers? Maybe I didn’t explain it clearly. I wrote this post so long ago! Basically, anything that is at the “BEST” rate available, that’s under 1mil$ would sell instantly. At the time of this post, it was $248L=$1USD. The same rate still applies today! Those people selling at $230L or lower, they’re really just holding out for a long time, maybe forever, maybe wishful thinking? I am still confused… I just want to transfer lindens money to my paypal, I don’t want to sell. But in order to get lindens to my bank, i have to sell right? I have 30,000 lindens that I want to sell. Market Sell	L$ 30,000	L$ 30,000	–	2014-09-01 08:52:59	2014-09-01 08:52:59	fill	US$ 116.73	US$ 112.64 Is that right? Am I doing it wrong? Lindens is not a real currency, therefore you wouldn’t be able to transfer Lindens directly to your paypal account without converting it to US Dollars first. So after you “sell” lindens aka convert it on the exchange, you can then transfer your USD balance to paypal. No what I’m asking is, did I do it right? I just clicked on sell and thats it? You don’t understand basic economics. how do I cancel a sell when I tried to offer a sell?